This slightly sweet and gingery salmon is a perfect light meal for two. Pair with sesame green beans or steamed asparagus with a squeeze of lemon and butter. Whisk scallion, Teriyaki Experience Pan-Asian Sauce and honey in a medium bowl until the honey is dissolved. 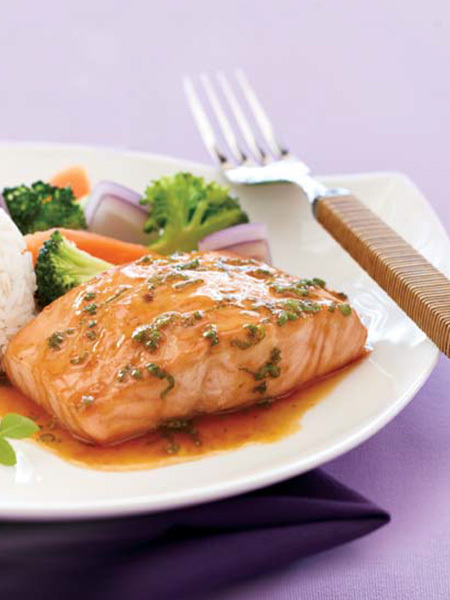 Place salmon in a sealable plastic bag, add 3 tablespoons of the sauce and refrigerate. Let marinate for 15 minutes. For best results, marinate for 4 hours. Reserve the remaining sauce. Transfer the salmon to the pan, skin side down and discard the marinade from the plastic bag. Bake the salmon on middle rack until cooked through approximately 12-15 minutes depending on thickness of salmon. Once cooked place on plate and drizzle with the reserved sauce.